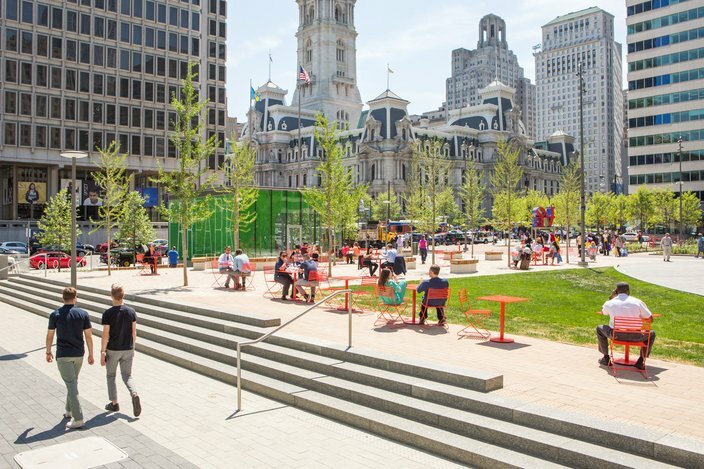 Should we give the new LOVE Park a chance? People at LOVE Park during lunchtime on Wednesday, May 9, 2018. It's a perfect May afternoon in Center City. Cliché perfect: mid-70s, no wind, no clouds. The type of afternoon begging you to leave the office and enjoy some time outdoors. 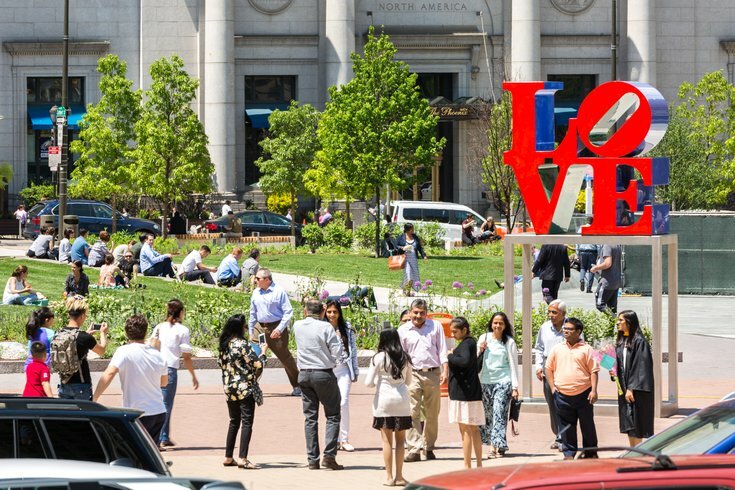 It's the type of afternoon Philadelphia officials likely envisioned for the redesigned LOVE Park, aka JFK Plaza, which has slowly and gradually reopened this past winter and spring after construction was plagued by lengthy delays. At a glance, it appears the overhaul of one of the city's most recognizable spaces is being embraced by its residents. A man naps on a bench on the park's west edge, a group of Drexel students sit on the grass and eat lunch in a circle, tourists intermittently take eventual Instagram pictures with the park's iconic and namesake statue. But if you've spent any time in Philadelphia's online universe over the past month or so, LOVE Park has been a disappointing failure; a soulless, flattened shell of what was once a thriving, multilevel public square. As the weather turns, however, signs of life have begun to emerge. And as Parks and Recreation Commissioner Kathryn Ott Lovell puts it, the dang thing ain't finished. A process that began in 2014 will culminate on May 30 with an official ribbon-cutting ceremony. "We keep saying, 'The park's not done!'" Ott Lovell told PhillyVoice. "I'm sorry it looks almost done so people think it's done. We've been saying all along we're still finishing it." Nick Marzano wants to be clear that his "meager" lunch of a protein bar and an iced coffee is "not a protest," referring to the way his "lawn chair lunch takeover" was characterized by one local media outlet. He admits that the Facebook event he set up for Tuesday implicitly jabbed at the new LOVE Park's initial lack of seating: "...a public park that is, for now at least, decidedly BYO chair." But ultimately, he just wanted to eat in the sun, not make a point. Joined by a handful of friends and perched on a corner of grass next to the main plaza, Marzano says when he first came out to the redesigned space, it was "desolate." Now, however, he's "glad to see it's coming along." Tables and chairs at the park's southeast corner — they weren't there when Marzano first visited — are about three-quarters full by noon. Marzano notes that he recently found out more seating is being added soon. 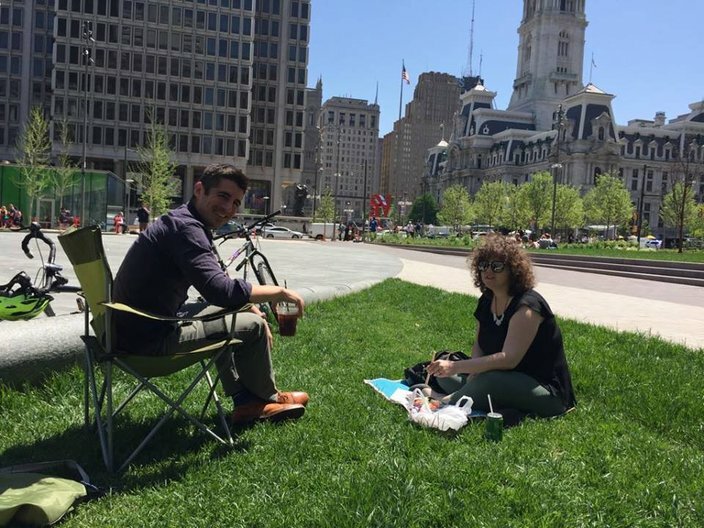 Nick Marzano enjoys his lunch with friend Jen Devor in the redesigned LOVE Park. The new seating has been coming from Europe in staggered shipments, according to Ott Lovell, with a new set to arrive just in time for the grand reopening. Lawn chairs with lowered backs, along with accompanying tables and ottomans, will give visitors a place to relax near the fountain. Marzano is pleased with the developments, but wishes city officials would have been a bit clearer that, when the park was reopened to the public this winter, there was plenty of work to do. "When a lot of prominent people have s*** on your park, there's more that can be done," Marzano said. It's not just prominent people (more on them later) criticizing the park. Many have lamented what's been described as a "sterile, horrendous" and "tragic" landscape, absent places to relax and congregate, and so far, missing a key component: people. Omg Love Park you are the saddest right now. But on this sweat-inducing spring day, you'd be hard-pressed to hear a bad word from the people spending their day in the now more-open space. Jim Gormley, a lifelong Philly resident, was skeptical of the "bland" park when it first reopened. "Now that the weather's broke, it's a pretty cool spot," Gormley said. "It's absolutely an upgrade. I love the green space." Daniel Knap thinks there are valid concerns about the redesign, but still thinks some of the "judgments are a little early." He's excited to take his kids to the fountain. "I feel like when the criticisms came out it did look different," added Megan Getz, who is sitting at one of the orange tables along with Knap. Colleen Murphy is among the Drexel students sitting in a circle on the grass and thinks the redesign is more "spacious and welcoming." Along with her friends, she certainly doesn't mind their spot on the lawn. "When we say there's no seats, we forget that people sit on lawns in parks," Ott Lovell said with a laugh. "People understand you can sit on your rear end." Liking the redesign has become a contrarian opinion. Nevertheless, there are those who share it. My unpopular opinion: the new Love Park isn’t so bad. The surrounding traffic patterns are still atrocious, especially the 7 unnecessary lanes of JFK, but having more porous boundaries of park actually helps that a little, as a pedestrian. Contrarian take on the redesigned Love Park: my 2- and 4-year olds loved it. "Let's go check out that place," my son said unprompted from across the street. They sat on the too-low steps eating cookies, balance-walked the length of the weird curvy concrete arc. The redesign's more notable critics range from the Inquirer's architecture critic Inga Saffron to Streets Dept. blogger Conrad Benner to University of Pennsylvania researcher Diana Lind. In a scathing column, Saffron described it as a "granite Sahara." In addition to calling new LOVE "depressingly s****y" on Twitter, Brenner summed up the new park as "flat and dull" in a PlanPhilly column that also decried the closing of Graffiti Pier. 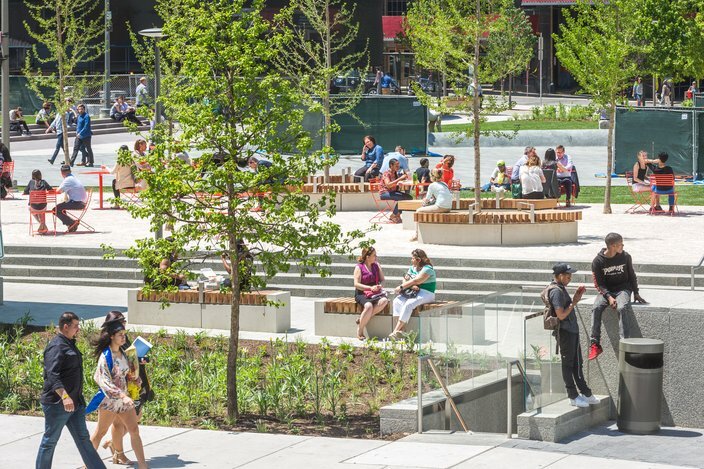 "Now, LOVE sits atop a bland square; no landscaping fills in the picture, just a dead-on view of the Parkway," wrote Lind in a piece for The Philadelphia Citizen. "Now people stand like passengers in an elevator car beneath the statue, mediocre architecture flanking them, a desert of pavers at their feet." Ott Lovell, as head of the department that oversees city parks, is obviously aware of these more thorough criticisms. She also says she understands "nostalgia" for the design, with its many layers providing vantage points from varying heights, all circling a fountain with an actual basin. Ott Lovell pointed to the exhaustive community input that went into the new design, which was created by architectural firms Hargreaves Associates and KieranTimberlake. Penn researchers helped hold several public workshops to see what residents wanted in the new LOVE Park. Ott Lovell says they spoke to thousands of people, and one of overwhelming requests was for more accessibility. Previously, LOVE Park was almost impossible to navigate in a wheelchair or walker. "I don't think the old LOVE park served users well. It didn't lend itself to the type of activity that people requested in the park," Ott Lovell said. "We wanted it to be accessible to people. There may be a bit of amnesia about some of the problematic aspects of the former LOVE Park." The more open layout obviously lends itself to more space for events, and some critics have contended the flattening was done so the park can serve as a glorified stage. But Ott Lovell has said private events won't happen at new LOVE often, and pointed to the popular lunch truck program that officials are looking to return to the park this summer. The previous location of the trucks, on the edge of the park, was a "disaster." But they now have a "wonderful" spot for the trucks to fit into. As for the bareness, Ott Lovell says the trees and foliage will take time to grow. "Landscape projects take a long time," she bluntly stated. These facts, by the way, are not lost on all the redesign's critics. Saffron wrote that, ironically, "the architects gave people exactly what they asked for," noting the community input. She also said the park and future programming will surely draw crowds, and cautioned that the landscape will take time to develop. Brenner, seemingly half-jokingly, suggested excessive community input may have been a bad thing. Ultimately, Ott Lovell says she appreciates concerns about the park, but stands by the new design and believes there's a bit of romanticizing about the old design. "The big concrete planters, did we love those? The walls over the park, did we love that? The steps, if you're not a skateboarder, did we love those?" Frankly, the answers for some will always be yes, yes and yes. Whether you LOVE or hate the new park, however, one thing was for certain on Tuesday afternoon: It's no longer dead. "The park is slowly coming back to life," Ott Lovell said.